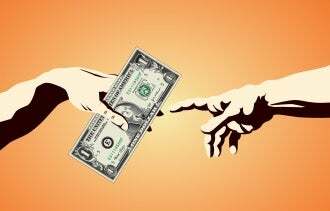 Do you have a rule about loaning money to friends and family? Maybe you should draw one up. When my younger sister was in college, she needed help with the down payment for a new car. I wrote her a check -- coincidentally, her birthday was just around the corner -- and sent it in a card, with the understanding that when she was solvent, she’d pay me back. Almost a decade later, that portion of my coffer remains empty; in fact, it’s permanently closed, since the one time I suggested she might pay me back, it caused a battle so ugly that my father had to step in to break up a fight between his adult daughters. There’s no place where financial generosity shines through more than with the people we love. While giving can feel good, it can also create discomfort if we’re repeatedly on the giving end of the stick -- or, conversely, if the gifts bestowed upon us by friends are the kinds that we can’t match. Sound familiar? If you’re an over-giver . . . or know someone who is, read on to learn how to extricate yourself from an awkward situation -- or stop creating one. Saturday night cocktails here, Sunday brunch there; sure, you’re happy to cover it. But when history repeats itself and you wind up footing the bill every time you meet up with a particular friend, or worse, loaning friends and relatives bigger chunks of money, things can go downhill, fast -- even if your intentions started off good. How it can hurt: Unpaid debts or inequalities (like picking up the tab for dinner five times in a row) can cast a pallor over your friendships. A study profiled in The Economist found that, surprisingly, people don’t really like people who are too generous. In fact, they dislike extreme selflessness as much as they dislike selfishness. Why? Simply put, your unabated giving makes them look -- or just feel -- bad. So, even as over-givers try to connect with others by giving gifts, they’re likely to create feelings of guilt instead of gratitude. Plus, as Alpert points out, there’s a difference between giving because you want to and giving because you feel you need to. The first may give you satisfaction, but the second could easily lead to resentment -- that feeling you have when you covered brunch because your friend “couldn’t afford it,” only to see his vacation photos fill up your Facebook newsfeed days later. How could he afford that, but not this? What you can do: It comes down to examining your motives: Why are you giving so much? What do you hope to gain? Or, Alpert puts it another way: Are you giving to preserve your friendships? If so, you might want to re-evaluate. Odds are, the people in your life will love you just as much without the lavish gifts. I have a friend I’ll call Rachel who loves to give her friends gifts: big, lavish gifts, like a $100 gift certificate to the spa for your half-birthday, or a beautiful box of hand-milled soaps, just because you happened to meet for brunch. While I, and all of our friends, love to receive what she gives us, at a certain point it becomes uncomfortable. It starts to feel imbalanced, and there’s only so many thank-you notes one person can write. Why over-giving happens: In her essay, Gilbert describes her over-giving as a way to be "petted and feted and praised and loved unconditionally for the rest of time." That’s the reason she mainly gave to her nearest and dearest instead of to faceless causes. "I could see (and feel!) the gratitude so personally; it was a drug-like pleasure," she writes. She confesses that her giving made her feel like she was “leveling off the apparent imbalance of my own crazy success -- an imbalance that had left me feeling profoundly uncomfortable." Giving benefited her friends, but it benefited her too. How it can hurt: And what’s the problem, exactly? Farley acknowledges how tricky it is to address the situation if you’re the one being doted on. "It can make you feel like a kept friend," he admits. In the case of Rachel, my friends and I don’t know why we’re getting all this stuff and we can’t afford (and don’t necessarily feel the need) to reciprocate. But should we? "The person who receives can feel indebted or inferior," says Morgan. "And the person who gives could hold that over the other person’s head. If I go to you and ask for money, it may help me out, but it could also make me feel irresponsible, reckless or inferior because I had to ask." Money isn’t the only issue -- in the case of a friend who constantly picks up the tab or presents you with tokens, ask yourself: Would you still be friends with them were that to change? If you feel like you owe them friendship in return for their gifts, it’s a problem. What you can do: Here’s a question: Are you encouraging the over-giver? Are you putting yourself in situations where it’s easier for her to spot you than not? For instance, she might feel the need to cover your dinner bill if you’re picking it apart. “If you’re someone who does that,” says Farley, "it means either that you’re not enjoying yourself, or that you probably can’t afford to be out at that time -- so you shouldn’t be." If you haven’t been encouraging her generosity and you’re an unwilling recipient, Farley advises sitting down with the friend or family member in question, in private, and approaching the conversation with gratitude. Often, he says, the giver has no idea just how offensive her social miscues have been, and having it brought to her attention can feel like a shock. "You could say something like, 'I'm so appreciative of your kind gestures -- thank you -- but I really can’t accept your gifts anymore,'" Farley suggests. It’s simple, to the point, and can prevent hurt feelings. Like anything else: If it’s making you uncomfortable, it’s up to you to change it.